Now for the deets on these happy little cakes! This is a bit of a Sprinkles Bakes recipe redemption for me. 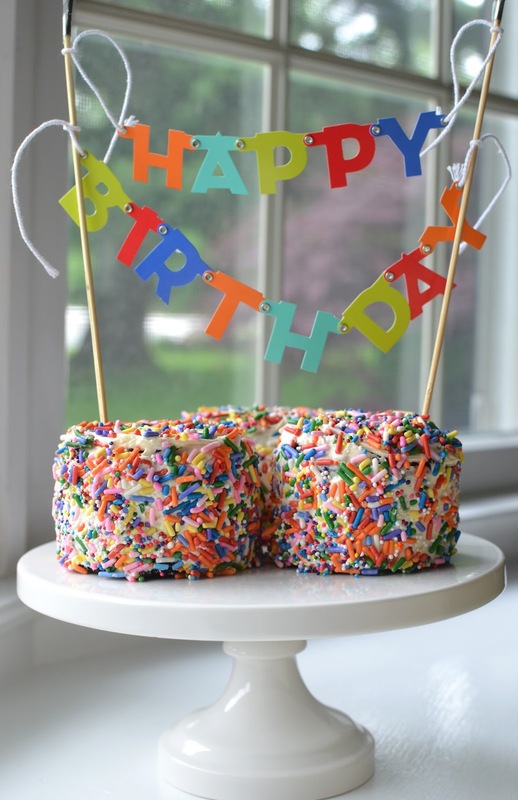 When I first saw the Sprinkles Bakes version, I knew I'd love to make something similar for my son's birthday. It's the reason I stocked up on paper muffin molds a couple of months ago (I also used them for the hazelnut balls). I simplified things versus the original recipe, which I also halved with no problems. Instead of a swiss buttercream, I used a standard American buttercream that my son knows and enjoys. To start, take the paper muffin cups (these standalone cups don't need to be greased and I'm seriously loving them) and lay an Oreo cookie at the bottom of each. 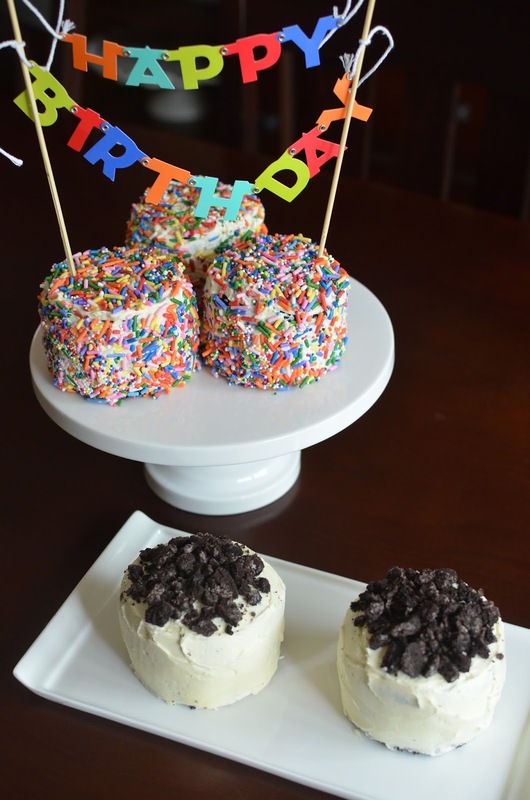 Use any kind of Oreo - birthday cake ones would be a cool choice - you like. Then, the cake batter. This is my favorite part! This chocolate cake batter is wonderful (very easy to make) and I would certainly use it again for cake or cupcakes. It uses cocoa powder, heavy cream, hot water, and oil, along with the usual components, and made for a very moist and flavorful cake. Bake for a little over 20 minutes, until a cake tester comes out clean, and you have these moist and tender chocolate cakes. The bottom of each has that Oreo cookie surprise. Isn't that just fun? Once the cakes are cooled, it's time for the buttercream and sprinkles! I sliced the domes off my cakes to make a flat top. Use a small offset spatula and first slather buttercream (I used a simple buttercream frosting made with butter, confectioners' sugar, vanilla extract, and heavy cream) around the sides of the cakes. Don't frost the bottom. 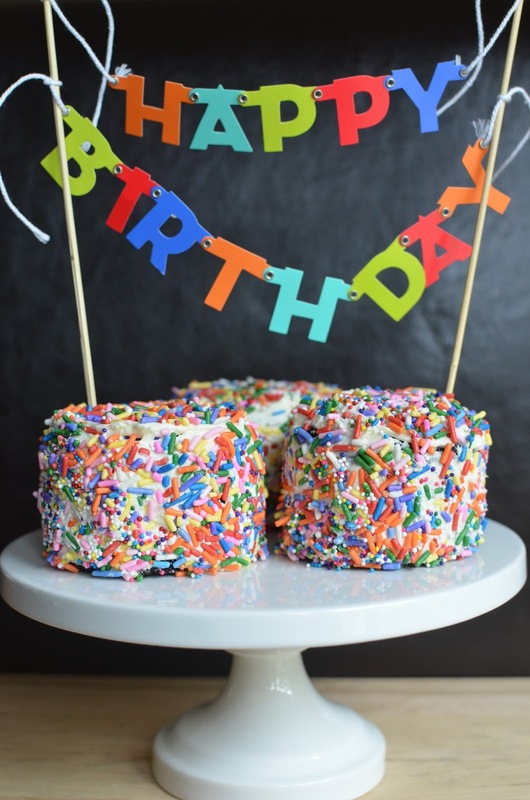 Place sprinkles into a rimmed dish or a rimmed plate not too much bigger than the cake. You want a good layer of sprinkles in the dish so you can roll the cakes around in it. If you don't have enough sprinkles (as I learned), buttercream will stick to the dish and it will get even more messy. 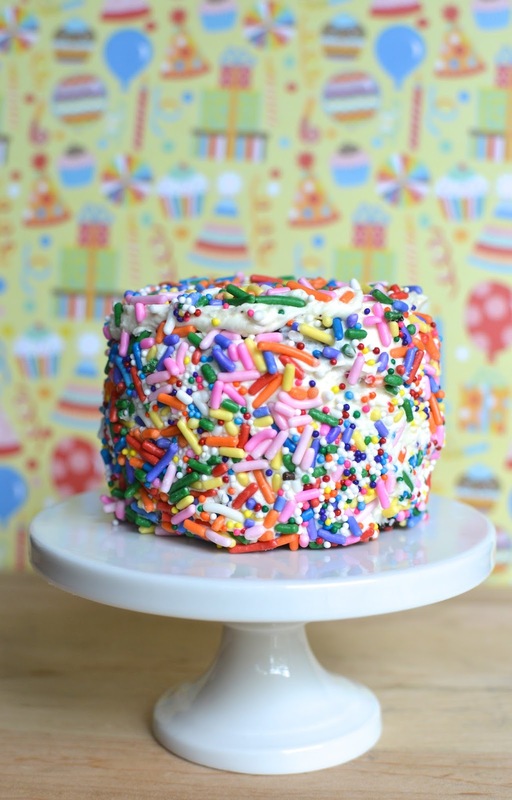 After the sides are coated, frost the top of the cake with buttercream and spoon sprinkles over it to cover. Remove the cake with a spatula (the bottom has not been frosted so it's easy to move around) and place on a serving dish or cake stand. Repeat with the others. These little cakes took even more sprinkles than I expected! So if you happen to encounter sprinkle-fatigue, do what I did and turn a couple of the cakes into cookies 'n cream cakes by simply frosting them (sides and top) and topping each with crushed Oreo cookies. I can tell you the simple cookies 'n cream cakes went down quite well at my house. And in all honesty, the sprinkles are fun but I did flake off some of the sprinkles so my son didn't eat quite that many sprinkles! I mentioned how much I liked the chocolate cake in this recipe. It makes an "old-school" moist cake with deep chocolate flavor. The texture is moist and tender but the cake holds together and isn't falling apart on you. It's a great basic chocolate cake recipe! These are so much fun to make. It can't help but put a little smile on your face. And birthdays - well, they are just the most special days! Preheat oven to 350 degrees. Set 10 paper muffin molds onto a baking sheet. Place an Oreo cookie at the bottom of each paper mold. Sift cocoa, flour, sugar, baking soda, baking powder, and salt into the bowl of a stand mixer fitted with the paddle attachment. Add eggs, water, cream, oil, and vanilla extract. Mix until smooth and incorporated, scraping the sides and bottom of the bowl as needed. Divide batter among the 10 paper molds. Bake until a cake tester inserted into the cake comes out clean, about 20-22 minutes. Let cool on a wire rack for about 15 minutes. Then gently remove the paper liner from the cakes and let cool completely. Place butter into the bowl of a stand mixer fitted with the paddle attachment. Sift confectioners' sugar into the bowl. Start by mixing on low speed until butter and sugar are incorporated. Raise speed to medium and beat for 3 minutes. Add vanilla and 1 tablespoon of cream and continue to beat for another minute. Add more cream, as necessary, to reach a smooth spreadable consistency. 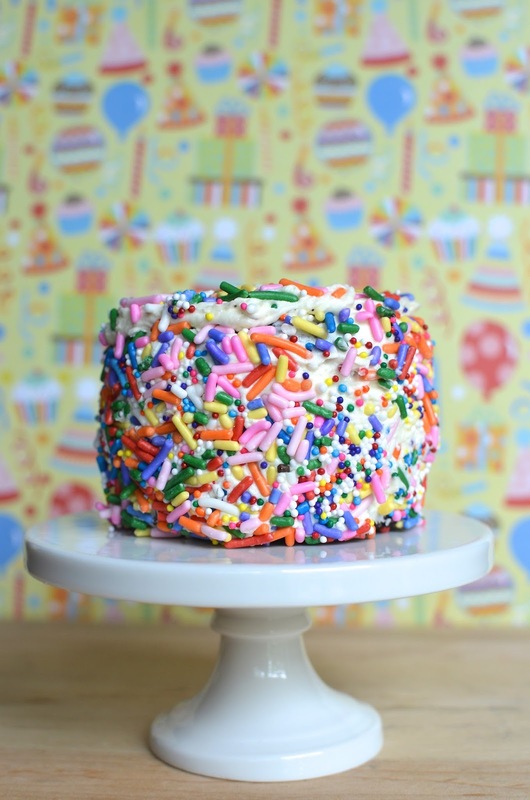 Place sprinkles into a shallow dish (a rimmed dish a little larger than the cakes works well). Trim the tops of each cake to make a flat top. Frost the sides (not the bottom) of the cakes. Take a cake, and roll the sides in the dish of sprinkles to coat. Set cake down into the dish, frost the top, and spoon sprinkles to cover the top. Remove cake with a spatula, set on to a platter, and repeat with the remaining cakes. For cookies 'n cream version: Crush a few Oreo cookies in a plastic sandwich bag. Frost the cakes, sides and top, with buttercream. If you'd like a neater look, start with a crumb coat, freeze cakes for about 15 minutes and then apply a second layer of buttercream. Decorate the top of the cakes with the crushed cookie bits. I want those for my birthday too! They are just too adorable. Happy Birthday to your boy, Monica. Aren't they just happy to look at? I hope you get a delicious and beautiful treat come your birthday, Angie. Happy, happy 10th birthday! 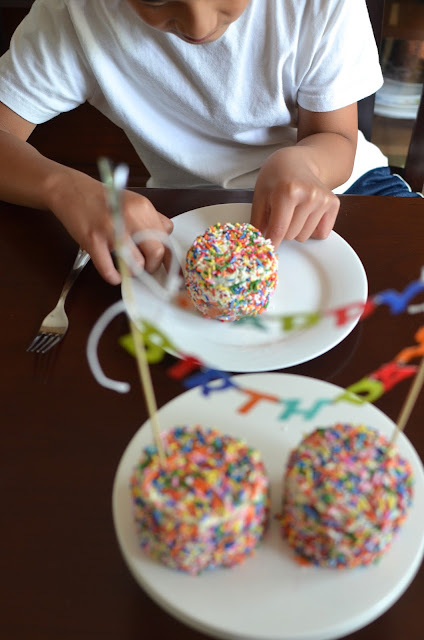 I love that these festive (sprinkles=festive) little cakes were part of your son's "birthday countdown" ! We have a silly tradition in my house that every birthday deserves a weekend. So, no matter when your birthday falls, it continues to be your birthday until a weekend occurs. That can provide a number of birthday cake opportunities. :) Two ice cream cakes and these chocolate beauties deliciously celebrates your birthday boy! :) The mom-son relationship is special. How lucky your son is to have your love and support in his corner! I am very curious to try this chocolate cake recipe. I have been searching for a basic chocolate cake, but the ones I have tried have been too fluffy or too dry. The heavy cream and oil, but no butter, looks like it made just what I have been looking for! And yes - I hope you try this cake. It's moist but it doesn't fall apart. It tastes really good! These are adorable! I love all these things too. Happy birthday to your son! That is so cool! Reaching double digits is so exciting and having your own amazing little cake and an ice cream cake too, is all fantastic! Congratulations on such a big birthday and for making such adorable little cakes. I have a pile of those paper molds and want to try something spectacular in them so badly - you are my inspiration! We are spoiling the little man just a teeny bit for turning double-digits. We have treats coming out of our ears. ; ) And I'm so happy to inspire you to do something with those paper molds. I love 'em! Happy Birthday to your son Monica. On my son's 10th birthday he wanted a lovebird and he named it Decade. So many great memories. Anyway, such a beautiful cake, looks like you made all his dessert dreams come true. Monica these cakes look AH-mazing and I bet your little boy must be so proud and happy!! Happy Birthday to him!! Thank you, Ami. He had such a blast at his party over the weekend. Birthdays are the best. These mini cakes are adorable Monica! 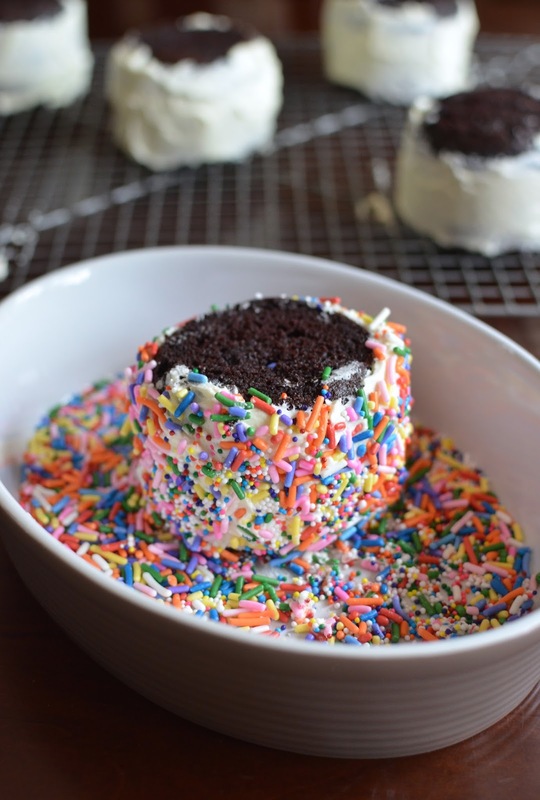 I love the sprinkles and the addition of Oreos. Happy birthday to your son! Thanks so much, Alyssa. Sprinkles just bring on smiles. Sending love and good wishes to the birthday boy! Thank you so much for the lovely birthday wishes, Bal! We appreciate it! Happy Birthday to you son Monica! Happy 10th birthday to your son Monica!!! I always asked for an ice cream cake when I was growing up (either carvel or from this local place that was my favorite!). These mini cakes are adorable! And so so festive with all those sprinkles! I love it! I love the little paper muffin cups so much! I wish they were cheaper but they really are great quality with the non-stick and reinforced bottoms. No clean-up is nice, too. And it really is crazy that the child is ten! I didn't want to make this all about *me* (haha) or I would stress how old this makes me feel! Happy Birthday to your son Monica...and what an awesome way to celebrate such an special occasion. The little cakes are so cute...I love it! Holy sprinkles Batman!!!! Can you please make my birthday cake for me next year? LOL love it. haha - so glad you like the sprinkles overload here! Birthdays are the best! omg! I love these cute cakes! I'm so gonna use this recipe! Thanks a lot for sharing! Yay! That's great, Marcela. Thanks! "Oreo stamp"...that's just it! Love it. : ) I'm sure you will be surrounded by good eats and a lovely cake for your birthday. Birthdays are the best! HAPPY 10th BIRTHDAY to your son! The sprinkles definitely scream festive! With the oreo surprises, the super moist chocolate cakes are the best way to celebrate! YUM! Thanks so much - I loved the moist cakes and the sprinkles are pure eye candy! Yum, what a great thing to make for gifts, looks amazing! Happy birthday to your son! These cakes definitely scream Birthday and they look so good. 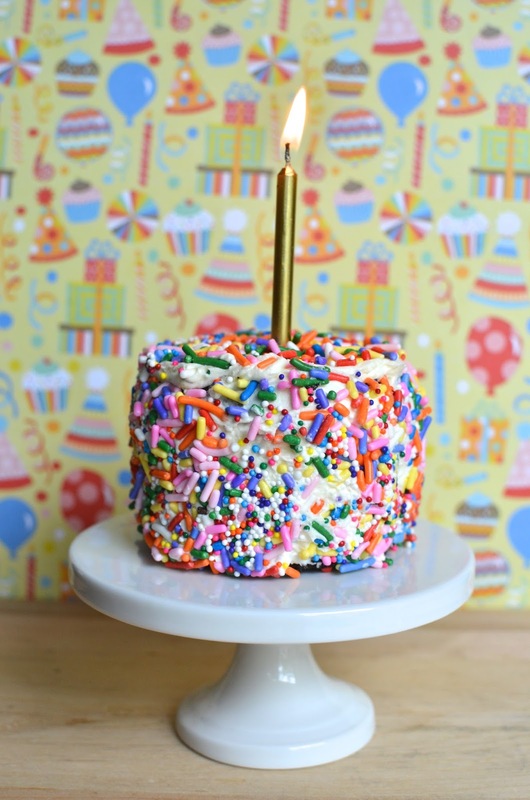 Love all the sprinkles and that they are made in individual portions. So fun! Hope your son had a wonderful Birthday! Awww, Happy BIG 10 to your lovely one! Happy Birthday! Hope he enjoyed his beautiful cake. You are a sweet sweet mama. Oh my goodness, just 30 minutes at a time, that's mere patience on your part. It's so tough with kids. I can't imagine going back to those days, although I'm sure we loved it. Btw..mine turned 10 in May. Hope you are having a good summer sweet thing. Hugs to your little one. Happy belated birthday to your sweet one as well! Turning 10 is like a huge deal. It boggles my mind how a decade went by. I know you share my feelings. : ) Summer is really gearing up here with school ending in a couple of days...it's always interesting, busy yet laid back. Thank you, Sonali! That makes me smile. : ) You have such a deep repertoire of cake recipes that I'm honored that you'd even consider something I put up here. Happy birthday celebrating to us all!